Tambra has been operating Tam’s Sunshine House for over 25 years. My name is Tambra Craven. I am a divorced mother with one wonderful child whom is now 25 years old. I have two sisters and a brother. 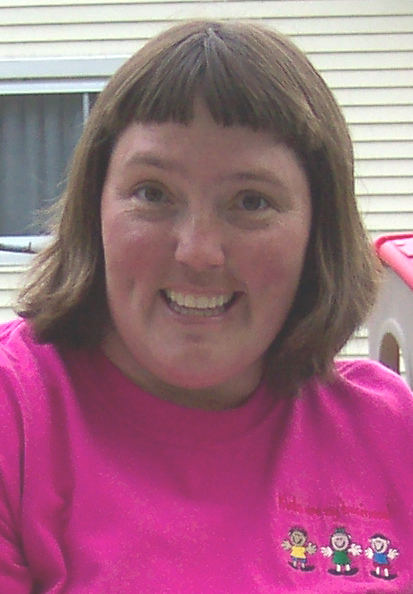 During my pregnancy, I learned my unborn child could possibly be a Downs-syndrome child or worse. It didn’t matter to me. I did make the decision at that moment to open my own childcare. Knowing that my parents had a really hard time keeping good childcare for my sister, I couldn’t let history repeat itself with my own child. 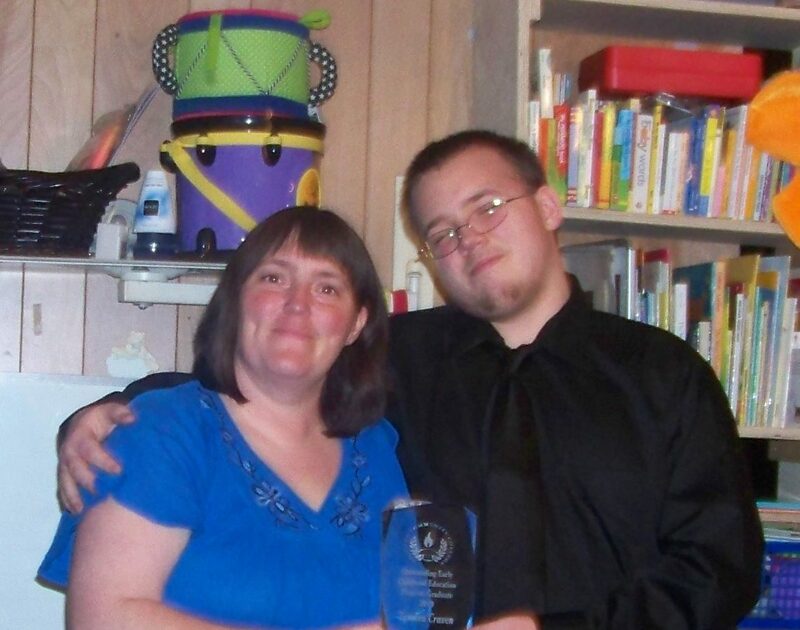 My son was born with severe breathing problems and a borderline diabetic. Yet, for all the fuss my son was “normal” with no severe birth defects. His breathing problems caused him to stop breathing if placed on his back. He also, I discovered, had severe allergies and asthma. These medical problems created a problem no child care provider wanted to accept into their programs. He was born in November of 1993. 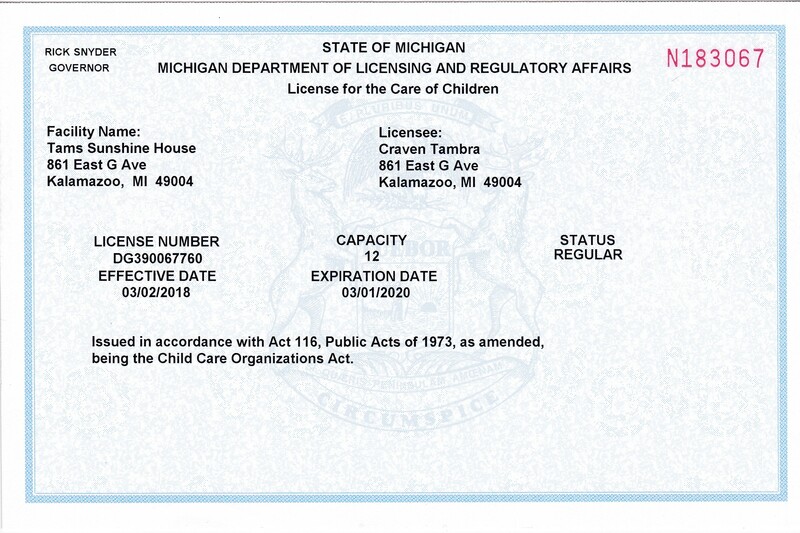 In April of 1994, I opened to the public my child care business. My son started school at the age of 4 a very happy and intelligent young boy. In January of 2001, his “birth defect” was corrected. He was born with a closed nasal passage which didn’t allow him to breathe correctly. I can’t begin to explain the relief that has come over me since that day. Knowing that opening my business wasn’t just the best thing for not only my child but the countless others I have cared for thru the years. In March of 2004, I was asked to join a group of women which would pursue the National Association of Family Child Care Accreditation which was funded by Bronson Hospital which was known as the ‘Bronson Project’. I joined, but I also started online courses on Child Day Care Management. This course has a diploma and allows me to have a better understanding of the business end of running a small or large child care facility. I continue to take courses in Early Childhood Education with a special interest in infant and toddler development. 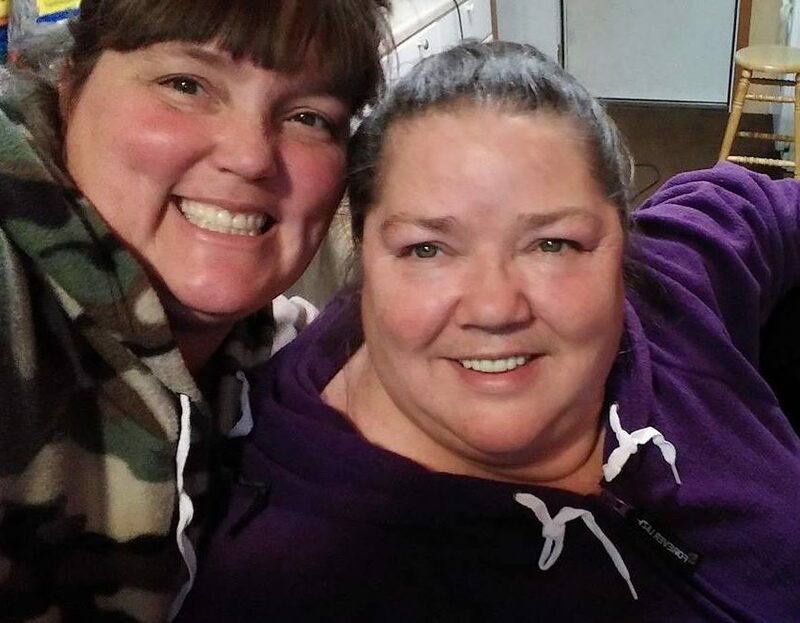 My sisters are an integral part of my life and Tam’s Sunshine House. They attend training seminars and are remarkable women in their own right now. My older sister represents the grandmother figure in the children’s lives on a daily basis here at Tam’s Sunshine Hous, while my younger sister has a carefree laid-back personality which is great for infants and toddlers who might not be ready for following the daily program. 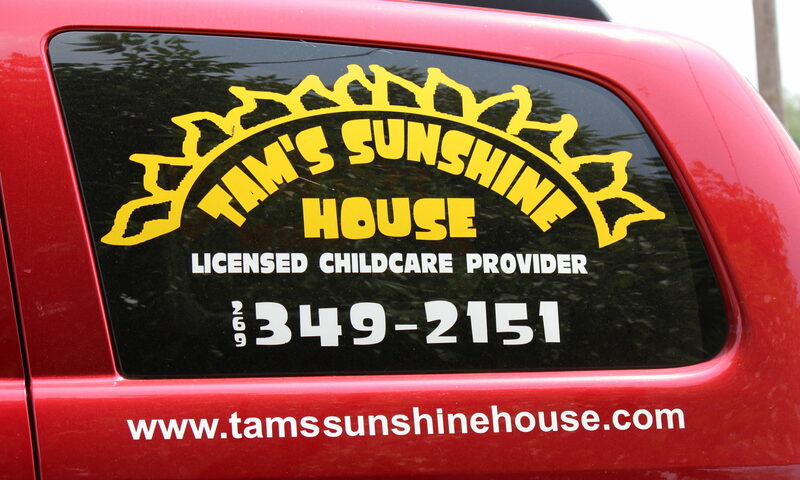 In 2005, Tam’s Sunshine House was our first Accreditation was issued by the National Association for Family Child Care. After finishing the Accreditation process, I worked on obtaining my CDA from the Council for Professionalism out of Washington D.C. I received my initial CDA in 2005 and have maintained my CDA status since then. 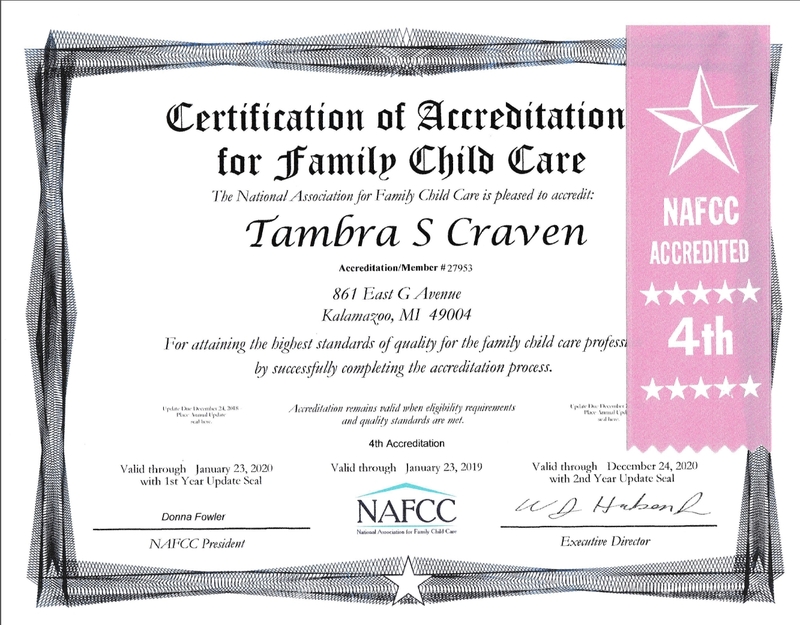 Currently, Tam’s Sunshine House is on its fourth Accreditation through the National Association for Family Child Care. One thing that I learned from the accreditation process was I wanted to learn and understand more about child development. 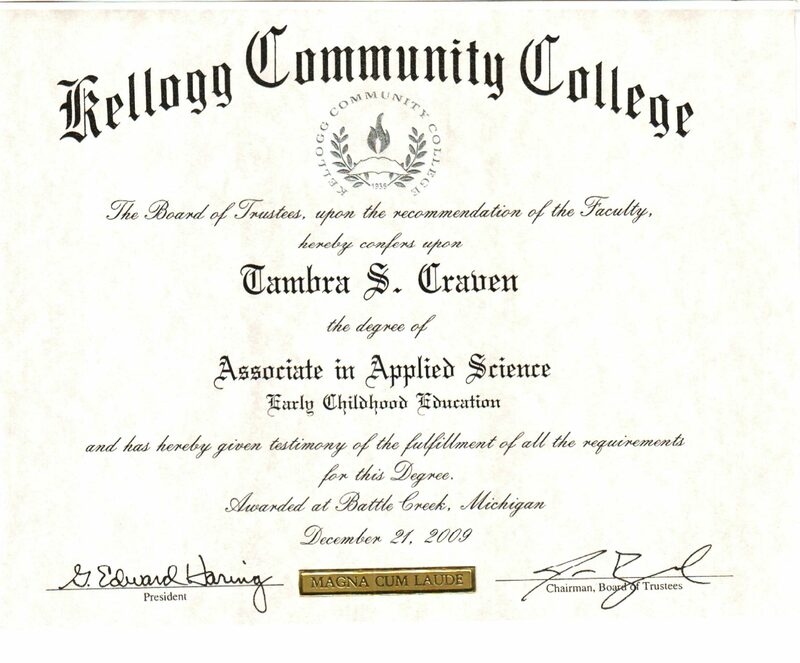 I started out in August of 2007 to just get one degree in Early Childhood Education from Kellogg Community College in Battle Creek, MI. Finishing top of my class and being awarded by my professors the Outstanding ECE Student Award for 2010 was a big high for me. I transferred to Western Michigan University in the Fall of 2010 to work on my University Studies program. 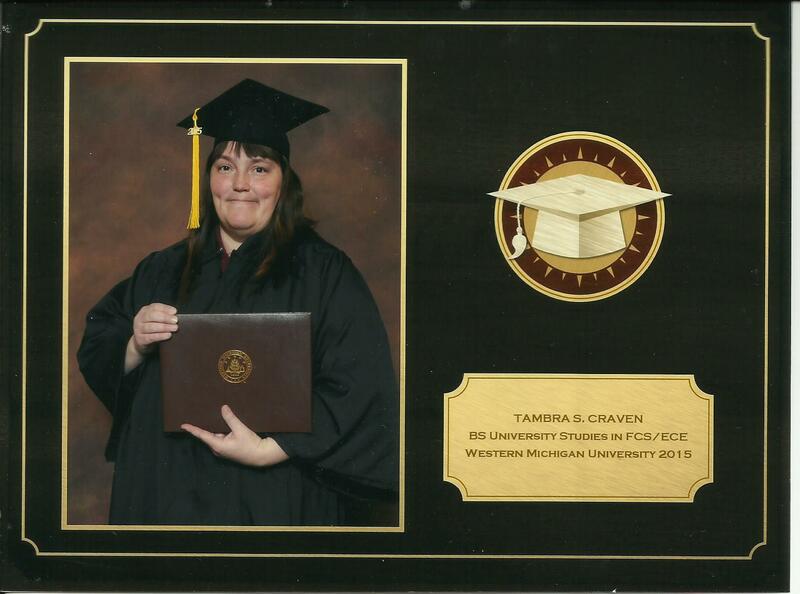 I graduated from Western Michigan University in May 2015. This is when I chose to become a trainer for the Office of Great Start through Child Care Resources in my spare time. 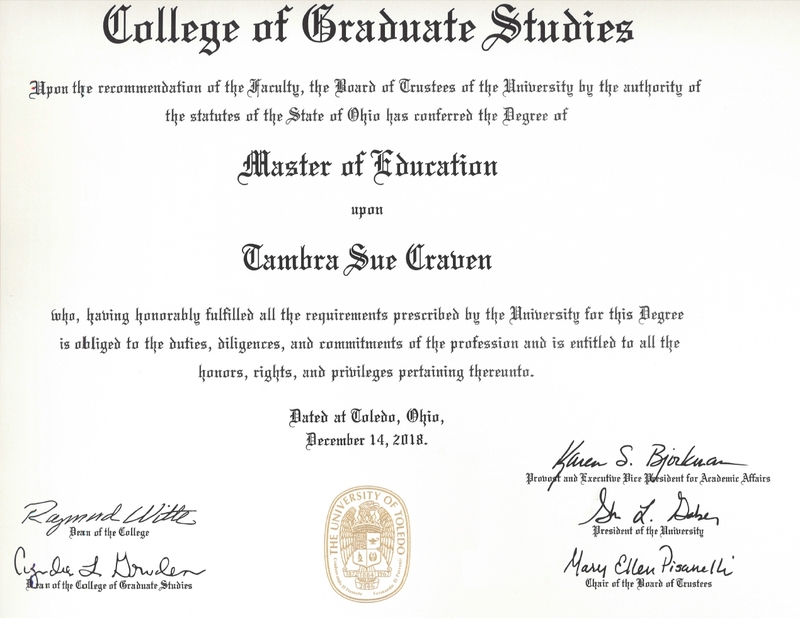 It was my love for learning that drove me to apply to the University of Toledo to work on my Masters in Education in Special Education in Early Childhood Education in the Spring of 2017. 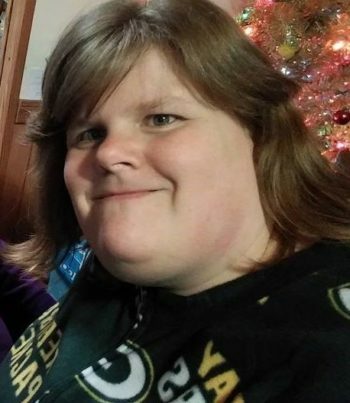 I recently graduated in December of 2018 with my Masters from the University of Toledo and could not be more excited to work with the children and families of Tam’s Sunshine House. Education has been a large part of my life for the eleven years which I directly relate back to becoming part of the Bronson Project to become Accredited to serve families in Kalamazoo County. The time with the ladies in the group taught me how favorable it is to have a network of professionals encouraging not just professional growth, but personal growth in discovering who you really are inside. Much like working with the children in my child care program giving them the support to learn, explore, and develop their natural skills at their own pace in a safe, nurturing and loving environment. Here at Tam’s Sunshine House it is our goal that children can learn and grow on their terms in a natural play environment guided by caring professionals whom are here every day waiting on them to arrive. 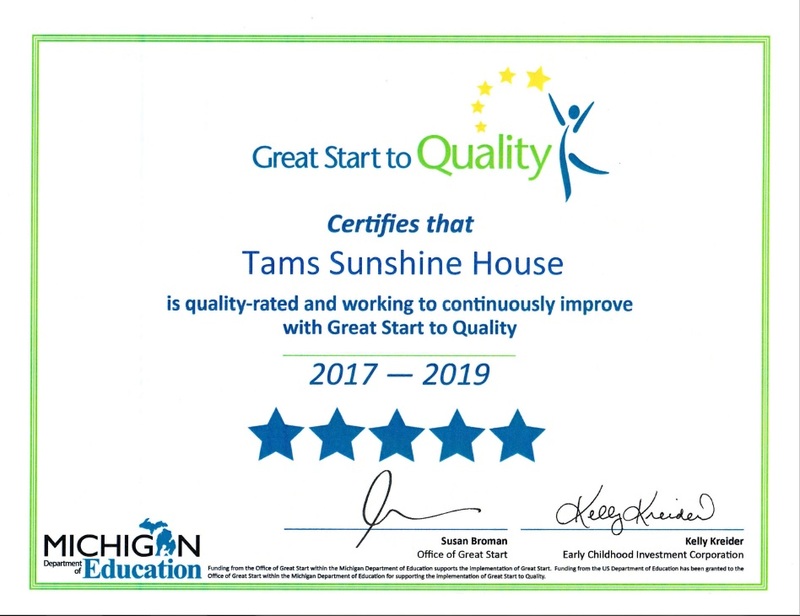 Tam’s Sunshine House was recently awarded a 5-Star Rating by the Michigan Department of Education. This rating is only given to those agencies and operations that meet strict guidelines for Childhood Development. Adherence to these guidelines is audited and observed by trained specialists who visit the site regularly, verify documentation for each child, review the program’s itinerary and schedules, on-site observations during typical workdays and interviews with staff and parents among other things.